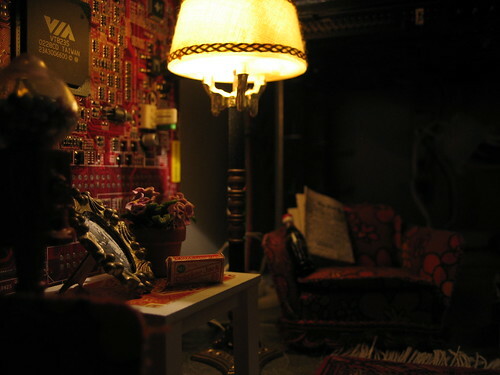 When I visited Chiron Bramberger a few weeks back he showed me some photos he had taken of dollhouse furniture staged in a computer case. I thought they were really neat. A couple of days ago I saw similar photos posted by Cory Doctorow on his blog BoingBoing, which has the reputation of being the most-visited blog in the universe. I shouted “hey!”, then read the post which attributed the photos to a Russian casemodder. Such is the power of contextualization that I instantly accepted that the photos on BoingBoing were only coincidentally similar to Chiron’s, and forgot about it. It turns out that those photos are indeed the ones Chiron took. Cory thought they were Russian because they had appeared on a Russian case-modding site. Now Chiron has a post of his own up indicating that those photos actually appeared on a whole host of A-list blogs (in fact, I don’t think he even knew they had also appeared on BoingBoing when he wrote that list). So Chiron’s little photo project seems to have a attained the maximum of internet fame that such art projects can. Held up for admiring inspection by thousands, perhaps millions of internet readers who frequent the very creme-de-la-creme of blogging sites. Which is a great thing in it’s own right: to have your idea enjoyed by many. That’s cool. But I think I’ve always assumed that when I see somebody’s project do the rounds on the cool-things blogs, it must represent some moment of personal success for the originator. Recognition and credibility and an increase in the world’s demands and attentions on that person. Perhaps sometimes it does. In this case Chiron apparently didn’t even know it was happening until after the fact. Chiron does have projects that merit attention; some are non-commercial, like the Broken Happiness Machines and Petsynth projects which have formed the bulk of the content on hughstimson.org lately, and also Flytrap Gear, which is commercial at least in the sense that it would be most successful conceptually if lots of people bought stuff. Did any of the dollhouse-mod traffic accrue to Petsynth or Flytrap? I’m guessing no, since there were no links even to Chiron’s sites. This isn’t a complaint, I’m not implying that the blogs which featured the dollhouse photos did anything wrong in doing so, or were obliged to do the kind of deep research which might or might not have tracked the photos back from the Russian site to Chiron, and I’m not disrespecting the basic fun of having Chi’s photos traded around by admiring folks worldwide. But the disconnect is interesting. It’s also mirrored somewhat by Morris Rosenthal’s experiences. He wrote a book about computer diagnosis and repair, and also prepared a series of excellent diagnostic flowcharts, which he posted on his website in 2003 hoping they might “go viral” and show up on CS students’ dorm walls and blogger blogs. He reports that over the years those flowcharts have indeed had some success on the internets, but didn’t blow up as a “discovery” of great novelty and nowness until suddenly this year (landing them for instance on BoingBoing). Apparently this sudden virality isn’t related to any change in the way he posts or publicizes the flowcharts, it’s just a random fluctuation in interest which was amplified through the law of increasing returns governing the link-blog universe into a random frenzy. A butterfly tweets in Tokyo Harbour and there is a storm over the Metafilter Coast. Morris also suggests that that wave of nonlinear virality helped book sales, but only a little. Perhaps that is due in part to bloggers’ tendency to link an item to the blog they discovered it on with the ubiquotous [via] tag, rather than to the item’s original source. Incidentally, it’s been my policy on hughstimson.org to link to the original source of an item if possible, although I’ve often had a twinge of guilt in doing so. I worry that it might appear that I’m claiming original research, when I’m actually riding the same wave of aggregate fascination that powers everyone else’s blogging. That kind of uncommericalizable commerciality makes me think of the current Twitter fascination. Every business entity in the world wants Twitter cred. And somehow this social networking addendum, best suited in form to trivial narcissism, has become a business obligation. Employees are obliged to twitter whether they want to or not. Why? Retweets and followers are not minted on the gold standard. You can’t turn them in to Bank of Twitter for an equivalent weight in gold shavings. The occasional stories about commerical returns (think “Dell Sells Computers on Twitter“) only seem to point up the ridiculousness of the possibility of making real money through one-liners. But businesses want profile, seemingly for its own sake. The connection between online success and integrated meat-world success has always struck me as a non-simple one, and the experiences of folks like Chiron and Morris Rosenthal seems to suggest it may be very non-linear indeed.